Passion is a powerful force, an energy born from what excites you. In order to be successful in your business, you must be passionate about the work that you do. If you are not passionate about what you do, you will quickly become burnt out or bored. Think about it. Do you know any successful people who are not passionate about what they do? 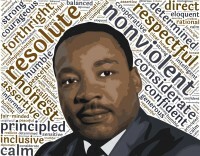 We can look to Dr. Martin Luther King, Jr. as an example of how passion spurs someone to accomplish greatness. Dr. King delivered his famous “I Have a Dream” speech in 1963 at the March on Washington. In that speech, he shared his passion with the world. Dr. King had a passion for justice. He was passionate in his belief that all men, regardless of skin color, were created equal and he used that passion to make equality a reality. He led the Montgomery Bus Boycott in 1955, which ended with the US Supreme Court ruling that segregation in public buses was unconstitutional. He organized and led many marches, including the March on Washington, laying the stepping stones for the passage of the Civil Rights Act in 1964 and the Voting Rights Act in 1965. He led the Birmingham Campaign, which spurred Birmingham, Alabama’s municipal government to change the city’s discriminatory laws. Dr. King’s passion for justice drove him to accomplish feats that have forever changed America and the lives of African Americans. So, what’s your passion? How can you harness the power of that passion in order to build a successful business? How will you change your city, your country, or maybe even the world?